China's turtles, lizards, snakes, and alligators feature prominently in traditional Chinese folklore and mythology. The critically endangered Yangtze Giant Softshell Turtle. China's turtles, lizards, snakes, and alligators feature prominently in traditional Chinese folklore and mythology. The most venomous among the snakes inflict fear into the majority of the Chinese populace. The skin of some of the native species of lizards and alligators was also and still is being used to make traditional medicines. For years animals have survived in the jungle biomes of China and Asia as a whole. For generations, these species thrived in the forest and streams ecosystem. Today, species such as the Yangtze Giant Softshell Turtle and Chinese alligator, which are endemic to China, are facing extinction. The Yangtze Giant Softshell Turtle is a critically endangered softshell turtle found in China. 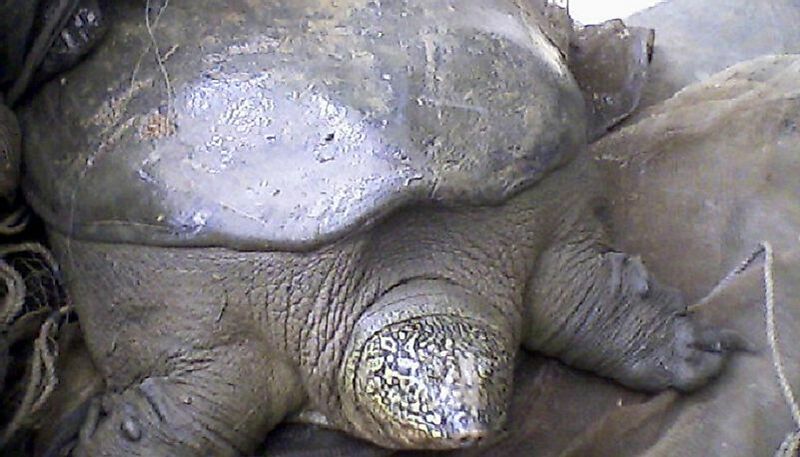 The turtle has a little head, a beak akin to the snout of a pig, and dorsally placed eyes. The Rafetus swinhoei inhabits the Yangtze River and Lake Taihu on the borders of Zhejiang and Jiangsu in Eastern China and the Yunnan Province in Southern China. The female Yangtze Softshell Turtle lays 60 to more than 100 eggs and nests them during the night and in the morning. The Softshell feeds on fish, snails, crabs, water hyacinth, leaves, and frogs. So far only three types of this Softshell turtle species are left. The International Union for the Conservation of Nature (IUCN) has declared the turtle a critically endangered species. The remaining population is protected in `the Suzhou Zoo. The threats facing the existence of the turtle are habitat loss, hunting for both local and subsistence consumption and harvesting of the carapace and bones to make alternative medicines. The Wildlife Conservation Society and the Turtle Survival Alliance are concentrating in breeding the captive turtles in China by improving their diet so that they can increase chances of the female turtle laying fertile eggs in the mating season. The Chinese alligator is a critically endangered animal endemic to Eastern China. The adult alligator has a length of around 5 feet and weighs 36 kilograms. Juveniles have a black background with yellow cross-banding. The snout is slightly overturned and tapered with teeth adapted for crushing the hard-shelled mollusks. The Chinese Alligator prefers the subtropical, temperate regions with low elevations and freshwater sources such as marshes, lakes, ponds, and streams. The species remain dormant in the winters preferring to burrow in wetland banks. During the spring, they spend the day basking to raise their body temperature until they become nocturnal. The species is docile but capable of inflicting serious bodily harm. It mates during the spring where mating groups gather. The male Alligator sinensis impregnates only one female in a season and the female lays 20 to 30 eggs. The primary threat facing the species is the conversion of its habitat to agricultural land. Rats also form the diet of these animals and when the rats are poisoned so are the alligators. There are estimated to be around 150 Chinese alligators remaining in the world. As such, the IUCN has listed the species as critically endangered. Primarily conservation centers of the species are the Anhui Research Center for Chinese Alligator Reproduction and The Changing Nature Reserve and Breeding Center for Chinese Alligators. The Bamboo Pit Viper is a venomous snake species found in the bamboo groves and forests of China and India. It prefers the moderate to low elevations but can also live at the sea level. It also lives in dense and open forests that have little vegetation. The snake has a triangular head with a broader neck. It has greenish upper parts, with or without brown, black, or red spots. There is a yellow or red streak along the outer rows of the scales with a red or yellow tail. The underparts are also green, yellow, or whitish. The species is arboreal and nocturnal becoming aggressive to the point of biting when threatened. It is ovoviviparous with the adult giving births to 6 to 11 young ones which are around 4.5 inches in length. T. gramineus feeds on lizards and birds. It is not yet threatened buts its demand by breeders in various corners of the planet is slowly ruining in the endemic populations of the species. The Armored Pricklenape is an agamid lizard found in China, Malaysia, Indonesia, Thailand, and Myanmar. The Armored Pricklenape is insectivorous feeding on crickets, meal-worms, earthworms, moths, grasshoppers, and wax worms. The Acanthosaura armata is oviparous with the female laying a clutch of fertile eggs around four months after mating. The lizard prefers to live in highly elevated areas with dense vegetation. The armored Pricklenape lizard lives in the treetops of the mountainous forests. They exhibit a sit and wait for behavior when hunting. The large lizard perch 1 to 2 meters from the ground until they spot their prey. They hardly display aerobatics when hunting. When fish-hunting, most of them do not submerge their heads so as to catch a meal. The greenish brownish scales protect the lizard from predators and also conceal it during hunting. It has sharp claws for a firm grip as they leap and run through the branches. The abundance of native species in China is incredible. Nonetheless, habitat loss is still threatening the survival and existence of these species. Clearing forests for agricultural land use destroy the habitats. Also, the pollution of water bodies also causes habitat loss threatening the species. Even with the hard work given by the Wildlife Conservation Society in China, the Chinese should understand the importance of biodiversity in human life for active conservation approach as only locals can protect these species from extinction.